Readers familiar with Jane Austen’s novels know this author sees through surface-only charm, social pretense and people who talk about manners but are not at all well-mannered. These readers also know to expect thinly cloaked feminism about a century before the women’s rights movements were causing waves and making some progress in England and the United States. But given Austen’s first two books, “Sense and Sensibility” in 1811 and “Pride and Prejudice” in 1813, audiences who see “Mansfield Park,” now at Northlight Theatre, will find in Austen’s third novel, out in 1814, that practicality no longer wins arguments. They will also note that one of “Mansfield Park’s theme stresses that financial benefit doesn’t excuse slavery. “Mansfield Park’s heroine Fanny Price is portrayed to perfection by Kayla Carter. She convincingly takes her character from a young girl trying to adapt to her relative’s moneyed and mannered life when sent there as a servant and companion, to her metamorphosis as an independent young lady who does not succumb to pressure and who is willing to lead an impoverished life. Unfortunately for audience members who left after a highly stylized first act where Price is mistreated and taken for granted by relatives and guests at Mansfield Park, they missed Act Two’s character growth, self-realization and the defiance by Price and the three offspring of the family’s domineering, father, Lord Bertram. The arrogant Bertram is skillfully played by Mark Montgomery. 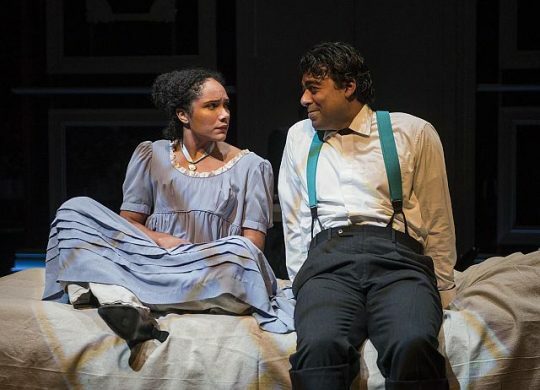 Kayla Carter (Fanny Price) and Gabriel Ruiz (Edmund) discuss life in Mansfield Park at Northlight Theatre. Gabriel Ruiz is well cast as Bertram’s son Edmund, a fine soul who tutors Price in reading, writing and speaking. He would like to join the clergy but has fallen prey to the wiles of Mary Crawford, a rich socialite, delightfully portrayed by the show’s writer, Kate Hamill. Meanwhile, Mary’s unscrupulous brother, Henry, disarmingly played by Nate Burger, wins the heart of Edmund’s sister, Mariah (Anu Bhatt). She is promised to a stupid but rich landowner. When she is forced into a marriage she doesn’t want, Henry turns his attentions to Price. But stay around for Act II to find out what happens. Chicago theater veteran Heidi Kettenring is marvelously believable as the upright, uptight Mrs. Norris who looks down on Price and aids Sir Bertram in his determination to brook no arguments from his family, nor listen to what they want. His bullheadedness is wrecking the life of his older son Tom (Curtis Edward Jackson) who tells the family that the “family business” involves plantations in Antigua that use slave labor. Sir Bertram is also likely the root of Lady Bertram’s (also Hamill) laudanum-dependent life. Hamill basically but not entirely follows Austen’s book. However her deviations aren’t important to the novelist’s themes. What differentiates the Northlight production from other shows seen in Chicago based on Austen books, is the unusually fast-paced, inventive action of director Stuart Carden. Its stilted, unrealistic movements of characters on and off-stage were interesting, if not disruptive in Act One. But the action quieted down enough in Act Two to appreciate Price’s character growth. 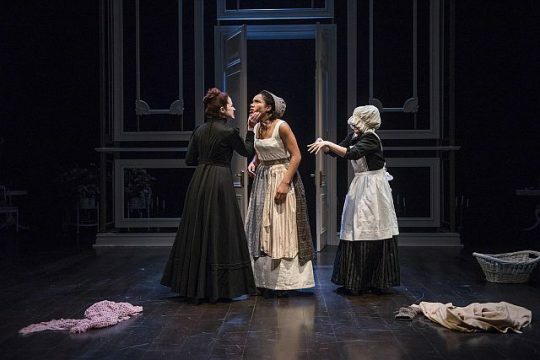 DETAILS: “Mansfield Park” by Kate Hamill based on Jane Austen’s novel, is at Northlight Theatre, 9501 Skokie Blvd., Skokie. Running timeL 2 hours, 20 minutes with one intermission. For tickets and other information call call (847) 673-6300 or visit Northlight.